Good day new friends! 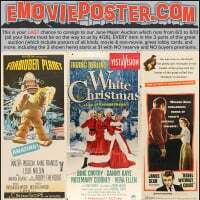 I am new to the forum and very new to collecting vintage movie posters. If I am in the wrong discussion board, please forgive and redirect. I purchased (3) 17"x11" marketing posters this afternoon. I have no idea if they are original, but I think they might be as the color and stock "appear old" and NSS info is listed. There is nothing like them listed on the internet that I can find. Similar, but they are obvious reproductions or the size is different. I posted the pics on my Facebook so please take a look if you have a chance. thanks! A guy named David Graveen made repros of a zillion movie posters in the 1980s and 1990s. They measure 11 x 17 and are exact repros. I would bet anything that is what these are. If they are, the only way they are worth anything is if you get an old 11x17 frame and put them in, and tell people your grandpa ran a theater "back in the day" and that you found these after he passed away. Post the pics here Swamp, makes it easier to keep the thread together.